Two days ago, I explained why all Serbians should welcome the arrest of Ratko Mladic and support his extradition to face justice. 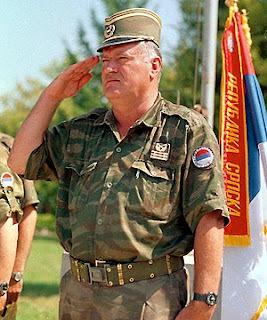 On 31 May 2011, the infamous former General of the Bosnian Serb Army was extradited to The Hague for his role in the massacre of more than 8,000 Bosniaks during the 1992-1995 Bosnian War. This extradition is "a milestone for international justice" and sends a message to international law skeptics. It is no secret that the international justice system is regarded by many Africans as a tool designed to target African leaders. A growing number of international justice skeptics often argue that individuals charged for genocide, war crimes, crimes against humanity and other heinous crimes are predominantly Africans. Former President of Liberia, Charles Taylor, is currently facing justice in The Hague before the Special Court for Sierra Leone (SCSL) for his role in the Sierra Leone Civil War. The President of Sudan, Omar al-Bashir, is currently wanted by the International Criminal Court (ICC) on charges of crimes committed in Darfur. Six Kenyans, dubbed the "Ocampo Six" were indicted by the ICC for allegedly perpetuating violence against civilians during the 2007-2008 post-election violence that claimed more than 1,300 lives in Kenya. The ICC has also issued arrest warrants for other Africans in the Democratic Republic of Congo (DRC), including Thomas Lubanga Dyilo and Bosco Ntaganda. More recently, the Prosecutor of the ICC applied for three arrest warrants for Colonel Gaddafi, his brother-in-law and son for their role in widespread violence against pro-democracy demonstrators in Libya. Many skeptics have wondered why there has never been a concerted effort to try George W. Bush for international crimes - even after the former president of the U.S. defiantly justified widespread torture and violation of international law. It is true that the majority of individuals in trouble with international law are Africans. However, this does not mean the system is designed to target Africans. The arrest of Ratko Mladic in Serbia on 26 May 2011 and his swift extradition to The Hague less than a week later adds weight to this assertion. Mladic is clearly not African, but he shares one thing in common with many Africans held or wanted in The Hague: charged with crimes against humanity, genocide, complicity in genocide, unlawfully inflicting terror upon civilians, war crimes and other crimes that have shocked humanity. For too long, international law skeptics in Africa have taken their eyes off the ball and focused on the assertion that international law targets the continent. This explains why many kick against the extradition of individuals wanted at The Hague. As a result, impunity for heinous crimes in the continent is endemic. The high level of impunity is compounded by the fact that national justice systems are either unwilling or unable to try perpetrators of human rights abuses - which is exactly why international courts step in. The extradition of Ratko Mladic, a powerful former General regarded as a war hero in Serbia, is testament to the fact that international justice is blind and does not target Africans. It is worthy to mention that Ratko Mladic is not the only Serbian or European extradited to The Hague. Others who have been extradited before him include, General Radislav Krstic, Vujadin Popovic and Ljubisa Beara. [Source]. Mladic was arrested after 16 years on the run. No matter how long it takes, perpetrators of grave crimes would eventually have their day in a national or international court of law.